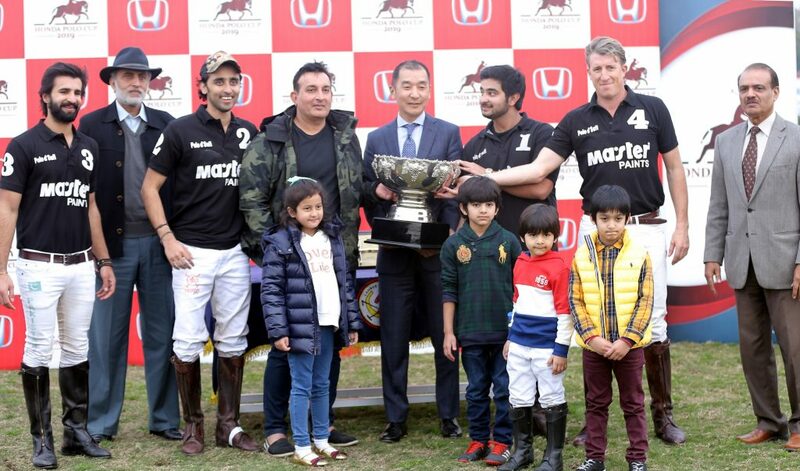 LAHORE: Master Paints Black clinched the Honda Polo Cup after defeating Master Paints/Guard Group by 4½-4 in the final played at Lahore Polo Club ground. Jami Li Hardi displayed outstanding polo skills and techniques and hammered a hat-trick in Master Paints Black’s title triumph while Raja Temur Nadeem scored the remaining one goal from the winning side, which had also half goal handicap advantage. From the losing side, Hamza Mawaz Khan and Nicolas Corti banged in a brace each. It was all alone Jami Li Hardi, who dominated the entire third chukker, as he first slammed in a field goal to draw the score at 3-3 and then successfully converted a 30-yard penalty to provide Master Paints 4-3 lead. The fourth and last chukker saw only goal coming from Master Paints/Guard Group, when they converted a 30-yard penalty through Hamza Mawaz to square the things at 4-4. No further goal was scored by either side and when the final whistle was blown, it was four-all. But the half-goal handicap then made the difference for Master Paints Black, declaring them winner of the final with the score of 4½-4. Nicolas Scortichini and Saqib Khan Khakwani officiated the main final as field umpires. Honda Atlas Cars (Pakistan) Limited President & CEO Mr. Hironobu Yoshimura as chief guest distributed the prizes ans awards.